When I reviewed Subsurface Circular last year, I was impressed with how Mike Bithell Games could pack such an engrossing narrative in a digestible game. While there were some problems with the linear structure and underused mechanics, I thought it was a great experience for those who want a little title with which to wind down. The recently released Quarantine Circular moves the conflict from a cramped train to a ship, with a cast of characters to keep me invested over its short yet very sweet runtime. Quarantine Circular puts you in the role of a group of international survivors who is trying to develop a cure for an unknown plague which has decimated the world. On their travels, they seize and capture a hulking alien known only as Gabriel as the crew scrambles to find a solution quickly. While the initial reaction to the alien’s introduction is one of surprise and fear, the crew must work with Gabriel in order to stop the plague from spreading. 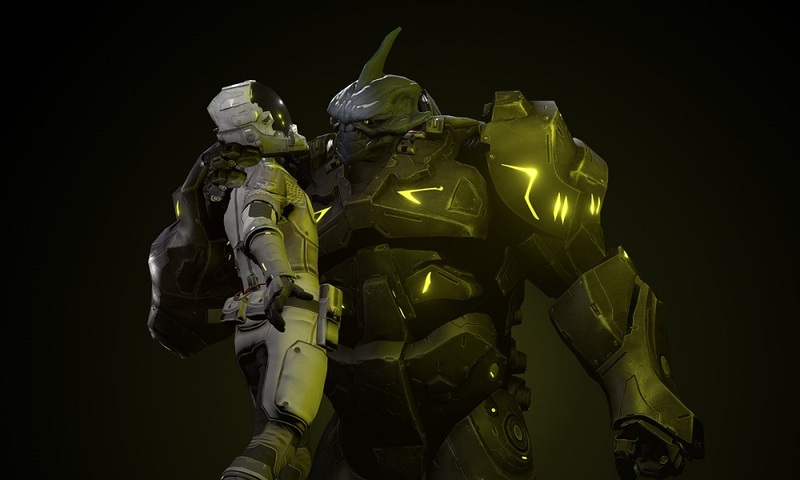 Much like the previous title, Quarantine Circular has a sci-fi feel to it, though it moves the story from inorganic life-forms (Subsurface Circular’s Teks are absent, but mentioned within conversation) to humans and one humanoid alien. From this change alone, the game feels vastly different from its predecessor, and also means that both games can be enjoyed as a standalone experience. Quarantine Circular’s story spans seven sequences, and functions as a visual novel in terms of conversation options. Throughout the story, you’ll control different crewmates and even Gabriel as they converse with one another on their ship. You’ll see the conversation play in the middle of the screen and will be presented with choices in order to progress the narrative. In addition, you’ll obtain focus points, which are key phrases that you can use in order to add more conversation options to the current discussion. Other than that, you have a notes section that you can use to recap the thoughts of the characters and get a feel for their personality, from the jovial Perez to the gruff Teng. You get to see the characters develop their trust or distrust in Gabriel, and it’s a very emotional journey. According to unlockable commentary, the developer wanted to expand upon the concepts and ideas in Subsurface Circular, and it shows: Quarantine Circular improves on most of the foundations that the previous one laid out. Conversations are more dynamic after the first sequence, with more characters entering the narrative at different points in time. The fact that you’re also playing as different people every so often is in stark contrast to your protagonist Tek in the first game, who was the only character you could control. The dialogue options feel more streamlined yet fleshed out, and each choice has more narrative weight. In addition, you actually have a choice, and actions in critical moments will have an effect on the endgame. The crew’s perception on Gabriel as well as some actions taken by members will change the ending, of which there are eight different ones. While a few of them are similar to each other (and they’re mostly text-based ending screens), this encourages some healthy replay value, which is great for a game that lasts a little under two hours. Like the last game, Quarantine Circular also has developer commentary for those who finish the game once, though it’s in the form of various dialogue options within the game rather than a static NPC that gives out commentary. I liked this unlockable due to it being another way for worldbuilding to occur, and if you have questions about things like the importance of a vague plague or the shift to a playable ensemble cast, you’ll be satisfied with the answers. Of course, Quarantine Circular is not without its problems. For some odd reason, it feels like the game runs worse than Subsurface Circular, as there was noticeable stuttering in the middle sequences (due to the game having multiple characters conversing with one another), though because the game doesn’t use action sequences, this is much more tolerable than faster-paced experiences. While sound design is sparse and tactful, I didn’t enjoy listening to Gabriel’s constant garbled speech every time the alien spoke; it sounded grating after a few minutes to be completely fair. Finally, while most mechanics that were underutilized are given a fair shake this time around (specifically on focus points), the notes section feels entirely superfluous here, with the section being used in a plot critical moment only once in the game. It’s nice supplementary information to be sure, but it does break the pacing for those who want to find out information organically rather than pausing the game and reading through entries. A vast improvement from Subsurface Circular, Quarantine Circular is a standalone sequel that tells its succinct story through engaging characters, a nice storyline, and a shift in protagonists.